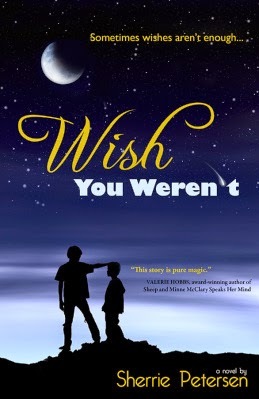 Wish You Weren't, by Sherrie Petersen (Create Space, March 2014). (nb: I was surprised just now, putting in the publishing information, to see that this was a self-published book--it struck me as perfectly professional in packaging and edited, so have no worries on that account). Marten is fed up with his parents' plan to move to Texas, with the way they ignore him in favor of his little brother Aldrin, and most of all, he's fed up with Aldrin himself. So when a shooting star whizzes by overhead, just after Aldrin inadvertently breaks his collectible Han Solo action figure, Marten lashes back--and wishes his brother wasn't there. Nothing happens at first. But the next day, in a museum gift shop, Marten watches as Aldrin vanishes before his eyes. His wish has come true. And in the confusion of search for Aldrin, Marten and his friend Paul are visited by a mysterious stranger, Tor, the personification of a star in the constellation of Orion. Time stops for all those around them. Tor has come to review Marten's wish (one he's already regretting, and which he'll regret more before things are done), and perhaps, if things go well, Tor can help Marten reverse it. Petersen ratchets up the tension very nicely indeed as Marten and Paul progress from passive spectators of the past to desperate adventurers very much present in the past searching for the thing that can restore the present (and Aldrin). And though I was somewhat taken aback by the arrival of the star dude (as one so often is when star dudes appear), Tor added both a fantastical element to the story and structure and impetus to the plot. The result was a crisp story, rooted in reality but pleasingly interspersed with the impossible. As an added bonus, Marten's mom is a scientist who's just been accepted into the astronaut training program--yay for moms breaking from stereotypes! It's a good one, I think, to offer to the older elementary school/younger middle school kid (ie, 9-10 years old) who likes reality twisted by unexpected, magical consequences. The one thing that kept me from personally loving the story is that Aldrin really is an utterly annoying child. I am a middle child myself, and so I can, in general, sympathize with both oppressed younger siblings and much put upon older siblings. Here my sympathies are entirely with Marten; I think Petersen went a bit too far with the awfulness of Aldrin. He is a brat, and his parents need to work on effective disciplinary techniques (such as I practice in my own parenting life cough cough*).